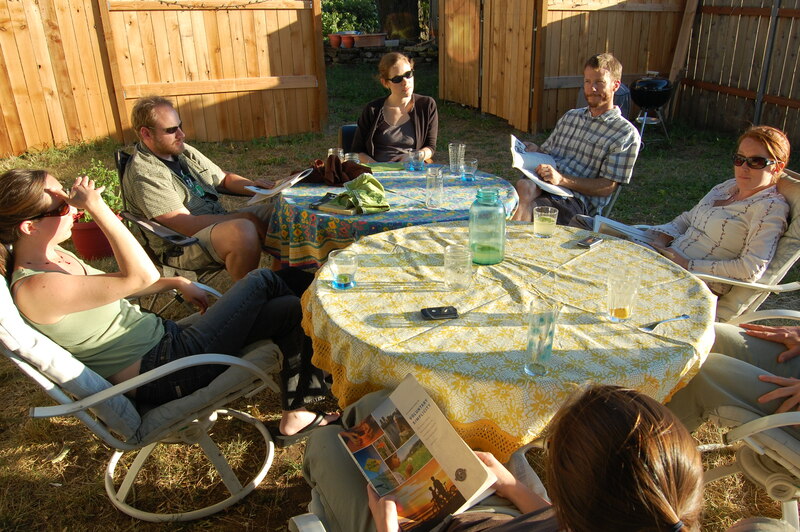 This Spring, a group in Concord, New Hampshire has been exploring the challenging and sometimes frustrating world of resource depletion and the many impacts of food production on climate change and the environment through participation in NWEI’s discussion course Hungry for Change: Food, Ethics and Sustainability. This is the sixth and last post from the Nourishing Words Blog, where author and course participant Eleanor Baron muses on conserving water, sustainable cheese production and the call towards a plant-based diet. A few weeks ago, this six-week discussion course ended with readings and questions about waste, better ways of managing our food system and working toward change. Our group, by this time, had settled into a comfortable rhythm together. Honest conversation came easily to us by now, and we’d long since established a common philosophy that “it’s all good.” Tiny, magnificent, global, local, personal or community—all efforts are good efforts. We are an accepting group. Our eyes were opened, once again. Mark Bittman got us thinking about how much energy goes into our food. Realizing that a one-calorie Diet Coke requires 2000 calories of energy to produce is a good reminder of why avoiding processed, packaged food is a sound choice for the environment. Eating close to the ground and choosing simple foods just has to be a good thing for our bodies as well as the planet. Thinking about food waste, first on a global scale and then on a personal scale, embarrassed us all. How can this be, that so many people are hungry while 209 to 253 pounds of food is wasted every day in North America and Europe? That’s enough to feed us all for nearly two months. How is it that we take this so lightly? This is not about somebody else; it’s about the small and large piles of food each end every one of usthrows away. Taking actions (or re-committing to actions) like shopping wisely, making stock, composting, cooking appropriate portions—just being conscious of the issue—will move us each steps closer to zero waste living. Just how hungry for change are we? That is the question that faced us in our last discussion. After reading and talking about the truly impressive, activist work of people like Will Allen of Growing Power, urban farmer and educator in Milwaukee, Wisconsin, and other inspiring changemakers, we were asked to think about what we could do in support of a healthier food system. We were, at first, silent on this question. The course book suggested follow-up activities like organizing community events or starting a letter-writing campaign. Still, we were silent. Oh, we do want change. That’s not the problem. In fact, as individuals, we’re already making important changes in our lives and in our communities. Teaching, writing, growing food, supporting good organizations, buying good food—we are living by our values. This course has prompted us to make even more changes and, perhaps, allowed us to be more confident in our beliefs and able to speak out even more. Our work together bolstered our resolve to continue those efforts, refining them over time. I had mixed feelings, at first, about our reticence to commit to a broader goal. But then I realized that we had, in fact, created something just as important. Just a couple of weeks after our last discussion, we gathered for a celebration potluck. It was there that I realized (quite literally) the fruits of our labors. Talk flowed easily, as we savored a rich variety of homemade dishes. Discussing our creations was a big part of dinner conversation—not just the recipes, but the sourcing of ingredients, in colorful detail. We loved our food. Our commitment to the values we examined in this course was palpable. Together, we enjoyed the simple good feeling of community around shared values. Wouldn’t you know that, just a few days later, we made plans for a second potluck? Only good things can come of this. I urge you to consider starting a Northwest Earth Institute course in your town. For a weekly commitment of a couple of hours of reading and a couple of hours of meeting, the benefits are huge. Besides, maybe your course will lead to a sense of expanded community for you, too.